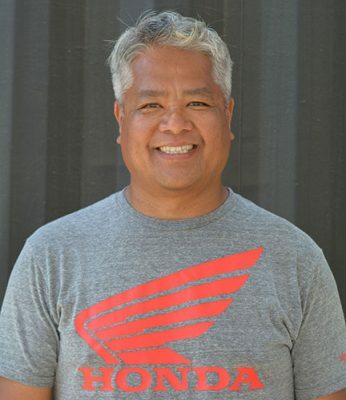 Jun Villegas is the leading MSF Dirt Bike School instructor at the Honda Rider Education Center in Colton, California and has been a champion of the USMCA’s mission to grow the sport of motorcycling through quality coaching. With the support of his employer who is a major supporter of the USMCA, American Honda has allocated a set amount of work hours that Jun will be able to assist and help the Motorcycle Coaching association with coordinating and hosting in-field evaluations and workshops as a USMCA Certified Coach. I was born in Quezon City, Philippines. I live in Corona, CA. When did you first start riding motorcycles? Do you remember your First Ride? Can you share that? Despite all the falls and frustrations, I was hooked and have been riding ever since. How long have you worked for American Honda? I’ve been fortunate to work for American Honda for 3 1/2 years now. How long have you been a key leader of the MSF Dirt Bike School? I became a Coach for MSF in 1999 and became a Coach Trainer in 2001. What is your favorite type of motorcycle ride these days? I like adventure touring these days. Exploring Death Valley, or all of the dirt roads in Utah, I feel that it’s an incredible way to see the US. I’m planning on dipping my foot in the arctic sea riding through Canada and Alaska, hopefully soon. Why do you want to help the USMCA initiative be successful? The moment I heard about USMCA and it’s goals, I knew I wanted to be part of it. Working in the industry all these years, I’ve always heard about the aging riders and the lack of new riders coming in to replace them. I’ve been fortunate enough to work in a field that I love and am passionate about. I think it’s time to give back. I’m super excited to work with the USMCA leadership and am honored to help.